A rhinestone is an imitation diamond made from rock crystal, glass, or even acrylic. Originally, they were made from rock crystals gathered from the river Rhine, but their availability was greatly increased when the French jeweller George Frederic Strass had the idea to coat the lower side of glass with metal powder around 1775, imitating diamonds. Hence, rhinestones are called Strass in the German language. These stones are usually chatons with no hole and a foil back to increase reflectivity. The fashion of rhinestones has persisted longer than many style mavens predicted, & is still very popular today. However they probably hit their cultural heyday a generation ago, owing in large part to the greatest rhinestone lover of them all, Liberace. 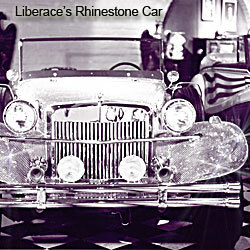 Liberace probably had the largest rhinestone collection on dry land. He sometimes drove his Rhinestone Roadster across the stage to his rhinestone-skinned Baldwin piano. Liberace's Platinum Mink Coat and Rhinestone Costume carries tens of thousands of rhinestones — even the heels of the outfit's shoes sparkle with them. Liberace was reputedly Swarovski's biggest customer. Which explains crown jewel — or crown rhinestone — found in Las Vegas' Liberace Museum: a clear, 51-pound, 115,000-carat rhinestone that the famous Swarovski & Company, of Austria, gifted to Liberace in 1982. Swarovski is the top-rated producer of quality crystal beads. Top of this Rhinestone - what are rhinestones?